Bee fighting -- always better in a bathing suit. Go Go’ers, Halloween may be over but that doesn’t mean swords, sci-fi, and the supernatural have been tidily put away in a box until next October. Ms. Go Go knows you’re relieved. From beyond the grave, the forge, and the celluloid screen, here are three events to distract you from that damn, looming turkey. Still Scaring the Pants Off You…. Ms. Go Go knows you don’t have much spare time, what with all that cocktailing, carousing and…cocktailing. Still, at least a little of your leisure time has surely been consumed with curiosity about “Emergo”, “Percepto”, and “Illusion-O”. When men were men, women were women, and everyone smoked. If you’re ready to get serious about cinematic showmanship — and the man who did it best — head over to Hollywood for William Castle Night at Larry Edmunds. Terry Castle, the youngest ghoul of the Genius of Gimmicks, will be signing Step Right Up, I’m Gonna Scare the Pants Off America, the newly reprinted edition of her director dad’s autobiography. There will be clips. There will be trailers. And to satisfy your “fly on the page” fantasies, there will be limited copies of Castle’s newly released House on Haunted Hill: A William Castle Annotated Screamplay. The cult director’s dad-ly advice to Terry, who co-produced remakes of House on Haunted Hill and 13 Ghosts, included how to hold a deadly axe and the best way to mix up a batch of the red stuff. So yes, there may be blood. Vodka and celery? You’re on your own. If your broadsword needs spiffing up or your leather jerkin needs some love, you’ll want to head over to The Sword and The Stone this weekend for Metalpalooza. Master Blacksmith/Armourer Tony Swatton will helm a two-day demo-ganza for all your sword-making, bronze-casting, leather-working, armour-crafting, gem-cutting needs. And while it really couldn’t get any better, expect sword-fighting and belly dancing. We all have our special talents. You can be confident that Swatton knows his way around a hammer and an anvil; his work can be seen in Pirates of the Caribbean: At World’s End, Angels and Demons, and Underworld: Rise of the Lycans. The guy also crafted the Burger King crown and some wicked looking metal stilettos. A Burger King crown and metal stilettos. Guaranteed to make sparks fly. Watch out for falling Confederates. Go Go’ers, whether you’re a stop-motion animation fan — and really, who isn’t — or you just like ginormous bugs in gorgeous Technicolor, you’ll want to set sail for Mysterious Island this Sunday. Showing at American Cinematheque, this is the 50th Anniversary of one of two sequels to Jules Verne’s 20,000 Leagues Under the Sea. And to whet your appetite further, it’s the “Twilight Times Blu-Ray Launch: Beautiful New Digital Presentation!”. So you know it’s gonna be good. 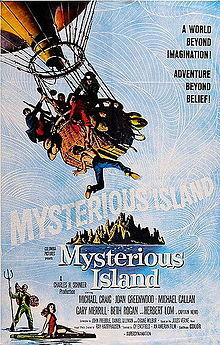 Mysterious Island — basically, a Confederate soldiers-in-a-balloon version of the Wizard of Oz — features Sixties-state-of-the-art, stop-motion animation (You WERE paying attention, right?) by Ray Harryhausen — a god among animators — and a thrilling score by frequent musical collaborator Bernard Hermann. Expect the usual sci-fi adventure elements: pirates, volcanoes, giant cephalopods. You always like to end Sunday with a giant cephalopod. Previous Post BEST FESTS: J. Edgar Hoover, Morgan Fairchild, and a Wigwam.